In my last post, we used a Host Storinator and three Storinator clients, configured to our Netgear XS708E Unmanaged Switch (using Cat 6 network cables). I managed to successfully string together a 20 and 30 GbE network, however did not do any real file transfers. So for this post, I'm using a samba share to actually move some files around the network. On my last blog post, one commenter pointed out that, “Balance Round-robin is transmit-balancing only.” This is correct – our network is only 20 Gigabit when leaving the host (i.e. reading from it). Going the other way, when writing to the host from the client, we should see that we are limited to 10 Gigabit, as a result of the bond policy used. I will verify this to be true, as well as investigate a different bonding policy that allows both transmit and receive load balancing, theoretically allowing 20 gigabit in both directions (reading and writing). All clients were connected to a samba share on the bonded Host Storage Server running CentOS 7. The share was mounted on each client rather than browsing the share. (This is important, as there is a significant increase in performance when mounting a share as opposed to browsing). Jumbo frames were enabled on all interfaces on the network, because this also makes a considerable difference in performance. All transfer rates were taken instantaneously for visual purposes. However, the transfer rates were also averaged and results were almost identical to instantaneous rates. A 400 GB file containing video clips of various sizes was transferred to each client from the host at approximately the same time (within seconds). Theoretically, the host can read files at 2.5 GB/s. This was verified locally on the host using iozone, a file system benchmark utility. Also, 15 Drive RAID0 on each client can be written to at over 700MB/s (For production environments, you may not want to use striped arrays – a much larger array of HDDs in a RAID6 configuration will give you similar performance). So, with 5 clients pulling the file at the same time, we should be saturating our 20 Gigabit Network! For the second part of the experiment, I went the other way, and wrote the 400GB file from each client to the host. Due to the fact that our bonding mode is transmit-balancing only, I should see a sum of transfer rates about 10Gigabits/second. Finally, to see if we could achieve 20GbE in both directions, I switched the bonding mode to Adaptive load balancing, and ran the same file transfer experiment. This image shows the file operations of all 5 clients reading from the host a few minutes after the file transfer started. 5 clients reading from the Host Storage Server using balance round-robin policy. When summing the transfer speeds, I get 2,271.5 MB/s which converts to 18.2 Gigabits/s. Considering TCP overhead, the 20 GbE pipe is completely full! 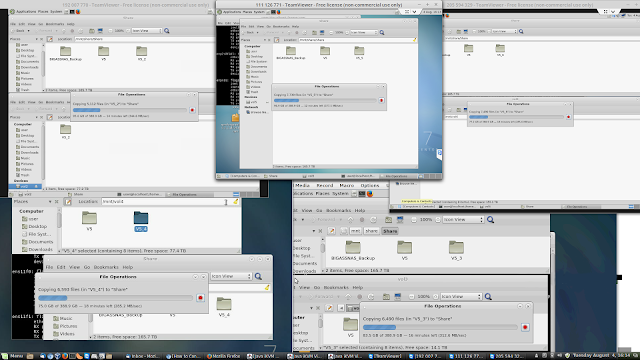 The next image shows the file operations of all 5 clients writing to the Host Storage Server. 5 clients writing to the Host Storage Server using balance round-robin policy. When summing the transfer speeds, I get 1,478.8MB/s which converts to 11.830 Gigabits/second. This speed is significantly less than the 18.2 Gbit/s I saw in the reads. I am confident this is because we are using a bonding mode that is transmit-balancing only. After switching the bonding mode to Adaptive load balancing, and running the same file transfer experiment the reads (5 clients reading from host) were unchanged at 18.2 Gigabits/s. I expected this, as it transmits similarly to balance round-robin. On the other hand, the writes (specifically, 5 clients writing to the host Storinator), did not do what I expected. (Well, I didn’t really know what to expect. But I was hoping for 20 GbE!). 5 clients writing to the Host Storage Server using adaptive load balancing policy. The sum of the file transfers was 12.844Gigabits/s, unfortunately not the 20 Gigabit I expected. However, there does seem to be some load balancing going on. I played with some parameters in the bonding config file, including up-delay, since documentation online said that the up-delay must be greater than or equal to the switches forwarding delay or performance will suffer. But, in the end, 12.844Gigabits/s was the best I could get. You can indeed saturate a 20GbE Network with samba using the Storinator series storage pods. While the host will transmit 20 Gigabits/s, it can only receive at a maximum of just over 10Gigabits/s when using bonding mode balance round-robin. There is a minor performance increase when switching to bonding mode adaptive load balancing, but this change definitely still doesn’t fully fill the 20 Gigabit Pipe. The next step to load-balance inbound traffic is to move to a managed switch. I don't have one on hand at the moment, but once I get one, I hope to do another set of experiments to see if I can achieve inbound transfer speeds that match outbound. Stay tuned! Still, I'm impressed to have achieved real file transfer from a server, to several clients at 20Gigabit/s, over an unmanaged switch that costs less than $1,000. That configuration matches many real world situations. Have an opinion about this network bonding experiment, or an idea for another test you’d like to see from the 45 Drives lab team? Let us know your thoughts in the comments.